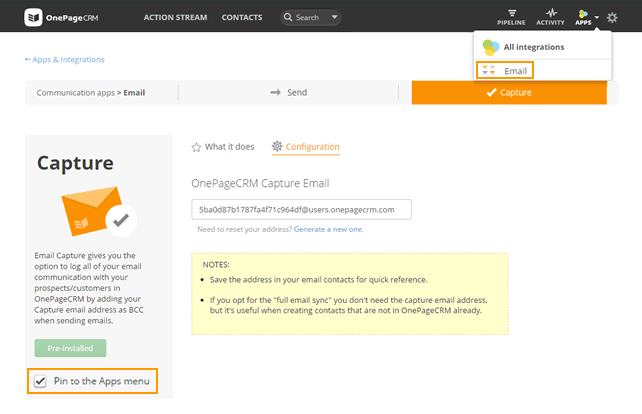 OnePageCRM's integration with Gmail just got more powerful. 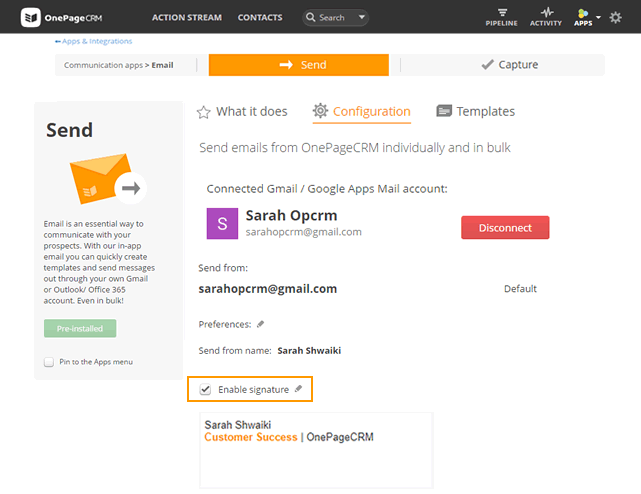 You can now, connect your Gmail account with OnePageCRM and send emails individually or in bulk & create templates directly from inside OnePageCRM. 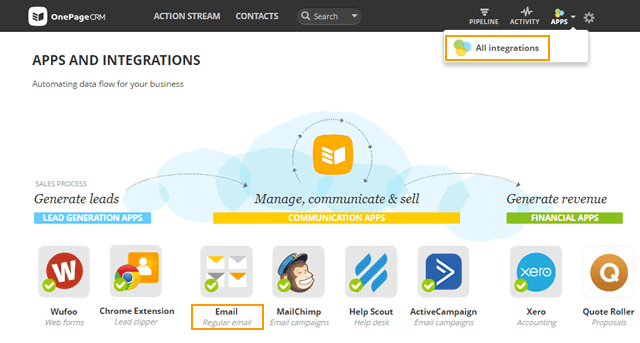 Open Apps → All Integrations → select Email. 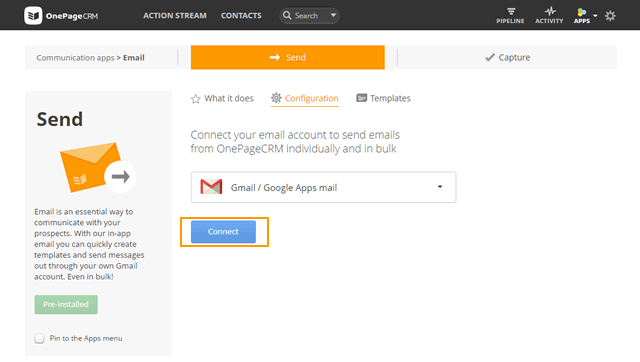 Go to Send → select Gmail / Google Apps mail from the drop down → click Connect to give OnePageCRM permission to access / send emails. If you wish to add an email signature, check the Enable signature checkbox and add your signature. Under Templates → select + New Template. 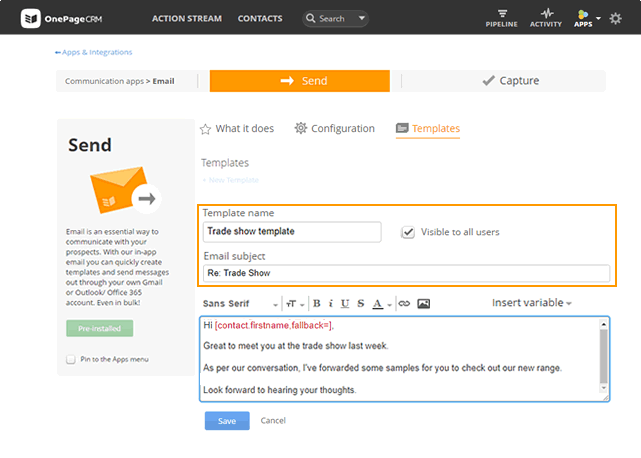 Enter Template name, Email Subject and email body text. Note: If you wish to hide this template from all users on your account, untick the check box Visible to all users. To add a variable to your template select Insert variable and choose from the following: First name, Last name, Full name, Organization name, Job title, Email, Title (Mr/Mrs), or any contact custom fields you've set up. Select Save to create this template. Select all contacts that you want to email using the bulk selector or individual contacts by selecting the checkbox beside their name. 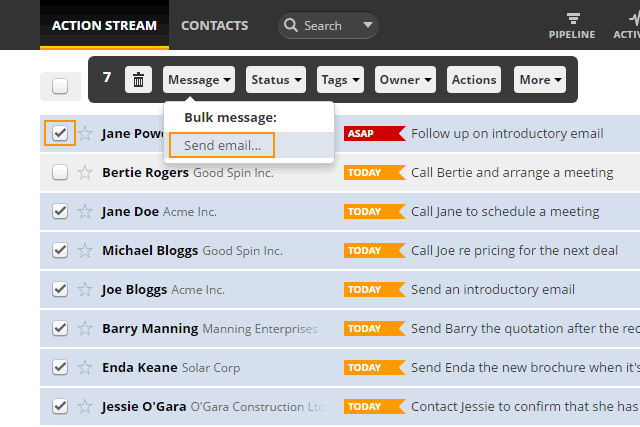 Note: You can also select contacts from any of the filters to the left of your Action Stream including: tags, status, lead source or filters. 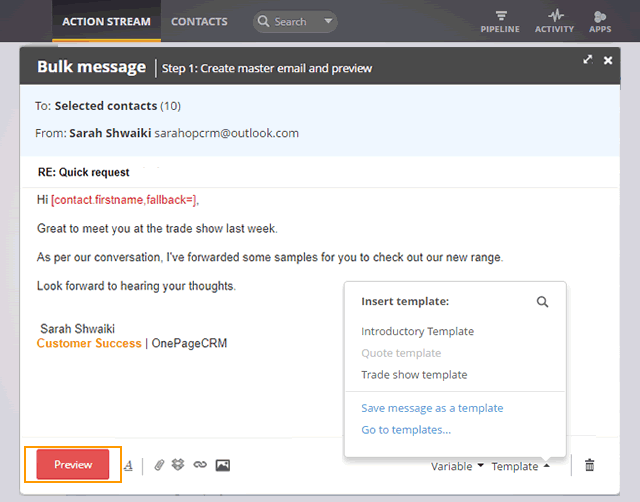 In Step 1: Create master email and preview, type your email message or choose a Template. Note: Variables appear in a red text and will automatically populate for each contact. Select Preview to view emails. Personalize email content by selecting the Edit individually link. Scroll through emails using the left and right toggles. Click Send all once you're happy with your email messages. To pin the Email integration to the Apps menu, select the check-box Pin to the Apps menu. You must have a Google Apps mail or Gmail email address associated with your OnePageCRM account - all emails are sent from this address. There is a limit of sending 200 emails per 24 hours. You can use more than one alias email address and you can edit your name for each alias email address. Email templates are only available once you've set Gmail or Google Apps mail as your primary mail client. Use Variables in your template and we'll auto-insert the matching details for each contact. First name appears as [contact.firstname], Last name appears as [contact.lastname], etc. Variables have a fall back option so "Hi [contact.firstname,fallback=there]", means that if there is no contact first name, it will default to Hi there. Variables also include contact custom fields (learn more about setting up custom fields here). You can use variables in your subject line of your templates. 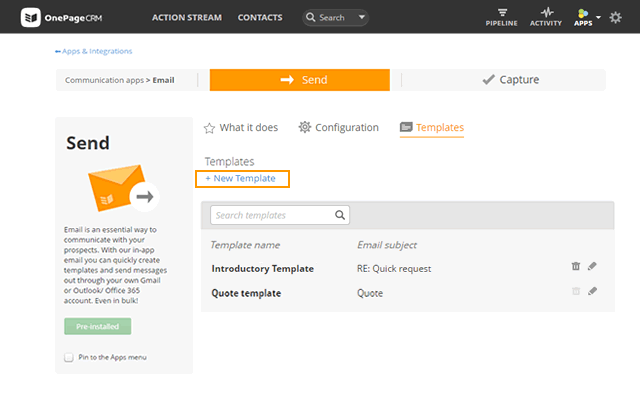 To save an email for future use, click on Templates and select Save message as a template to reuse this email. 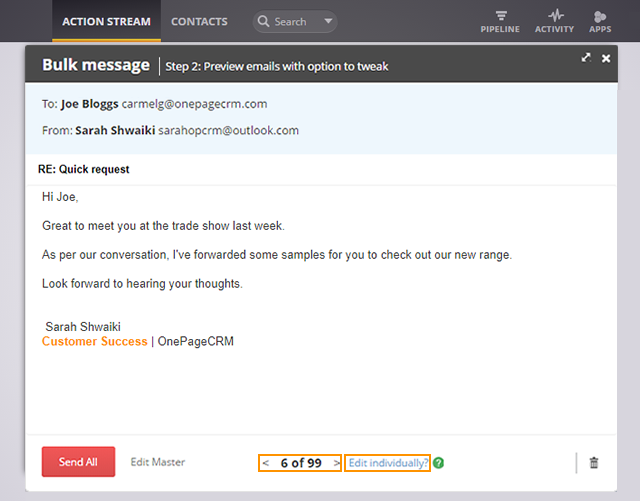 You can customize your subject line to include first name, last name, company etc. If you chose to 'open in your email client', your email signature will lose it's formatting as Mailto links do not support HTML.